An Indie Computer RPG of Comedy and High Fantasy. Also available on Steam and Desura! 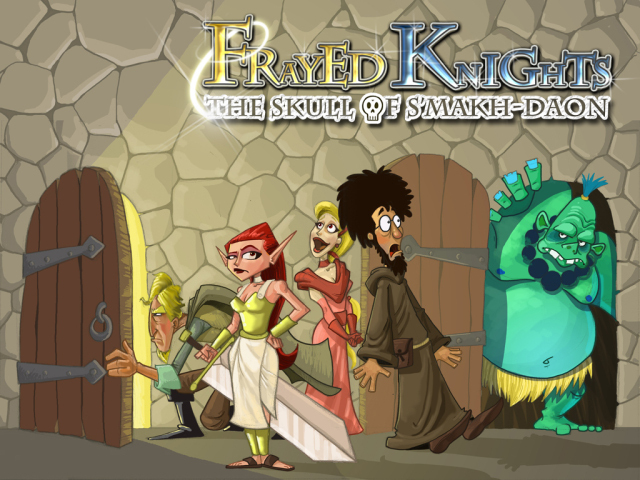 Frayed Knights: The Skull of S'makh-Daon is a 3D indie computer RPG for Windows featuring turn-based combat, old-school sensibilities, and a story of high adventure and comedy. Who says RPGs have to be so serious? The wrong people at the wrong time. Challenging, turn-based combat in a game that plays at your pace. A unique "Drama Star" system that rewards the player for playing through tough situations instead of reloading and replaying. A spell named, "Power Word: Defenestrate." Over a hundred base spells, most with several upgraded variants. An innovative trap-disarming / lockpicking system using character skills and items to disable a device one component at a time. Over 80 feats to customize your party as they progress through the game. A detailed, "stats-heavy" rules system... which you are free to ignore if you choose. Nearly 200 different items to be used and abused by your characters. Sixteen "dungeons" (interior adventuring areas), five outdoor areas, one village, an alternate dimension, and some green dude's one-room hovel.